Indonesian nature offers a lot of tourist attractions such as mountain, crater, beach, zoo, or even temples. You should not forget about lake tour because Indonesia has numerous beautiful lakes which will satisfy your eyes and relieve your stress. 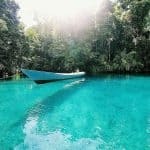 Here are the list of most beautiful lakes in Indonesia that you may visit. This beautiful lake located in Labuan Kelambu village, East Kalimantan. In Indonesian language cermin means mirror so Labuan Cermin is named after that philosophy because the water in this lake is very celar, nearly transparent. This lake is also unique has two kinds of water which is saltwater and freshwater. The color of this lake is very beautiful, it reflectes sea water degradation; dark blue, light blue, turquoise, tosca and white. Interesting, is not it? 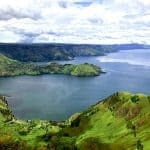 This is one of the most popular lakes in Indonesia, Toba lake located in North Sumatera which has 100 km length and the width of the lake is 30 km. Toba Lake has been a favorite site to visit in the region. There are a small island in the middle of this lake which is called Samosir Island and little that you know, this small island is as vast as Singapore. 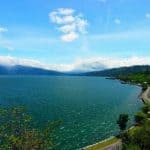 This Samosir island is still original, rich with local cultures and natural scenery which will captivate your attention. What is the first natural site which flash in your mind when you heard Papua? Raja Ampat, right? 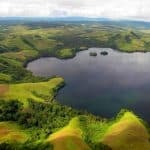 There is a lake named Sentani which is considered as one of the most beautiful lakes in Indonesia. Sentani tribe is the local people who lives in the islands near Sentani lake. Maninjau lake is created by the eruption of Sitinjau mountain and located in the Northern part of Padang City. Different with the other lakes, Maninjau is situated in altitude of 460 meters above the sea level. Pretty high right? However that is the fascinating point of this lake. Another Indonesian impressive lake is Ranu Kumbolo which is located in the foot of Semeru Mountain, Malang, East Java. Ranu Kumbolo is nicknamed as a hidden heaven because you need to experience mountain tracking activity in order to reach this location. Same with Ranu Kumbolo this lake is also located near a mountain, in Rinjani Mountain’s carter to be exact. Segara Anak is named after the water which looks like a seawater. Mount climber usually resting here before continue the destination to climb Rinjani Mountain. Another additional point for this lake is added because there is hot springs which is believed to cure any kind of diseases. An ancient tree also exist which is believed to grant your wish. Don’t forget to increase and gain your knowledge with reading information about Hiking in Indonesia. 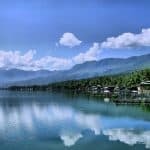 Poso Lake is located in Poso district, Central Sulawesi and nominated as the third most big lake in Indonesia. What makes this lake interesting is the existence of white sands on the edge of the lake, making it look like a beach with a white sands. Not only that you can also continue your lake tour to visit Bancea which is located near the Poso Lake. This tourist site is a place of the biggest orchid conservation in the world. Flores is a beautiful island to visit. There are three lakes which is located at the top of Kelimutu Mountain named Kelimutu Lakes. Surprisingly each lake reflects different water color therefore the traditional people considered the lake has supernatural power. Furthermore, Those three lakes’ names are Tiwu Ata Mbupu, Tiwu Nuwa Muri Koo Fai, and Tiwu Ata Polo. 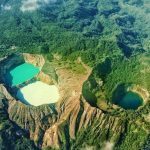 On the other hand, the perfect time to visit Kelimutu Lake is dawn so you can see the pleasing sunrise which can catching your eyes with amazing scenery. Know more about Volcano Eruption in Indonesia. Toba is the first, Poso Lake is the third, and this Singkarak Lake is the second biggest lake in Indonesia. This lake is located in Solok District, West Sumatera. Here are several things that you can do during your lake visit in Sigkarak; fishing, ride a canoe, and enjoying the scenery. Interestingly a species of fish (Ikan Bilih) lives here. Furthermore, to walking and want to know complete view of Singarak lake, you can ride your motorcycle or maybe car. Tondano Lake is located in Manado, North Sulawesi. 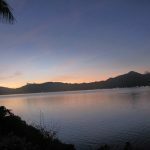 This lake is the biggest lake in North Sulawesi and has been choosing as a proper place to visit during holiday not only by the local people but also by the people outside the region. On the other hand, there are three mountains surrounding the lake which is Lambean, Kaweng, and Masarang mountain. For those who like fishing could enjoy their hobbies in the edge of the lake. Despite you can enjoy fishing, you will see the beautiful scenery that this lake offered. Fun, right? Paniai Lake: This is another lake exist in Papua which is situated in mountains area at altitude 1.700 m above the sea level. This lake is also decorated by high hills which surrounding the lake. Some kinds of freshwater fish such as golden fish, sembilan hitam fish, eel, and even rainbow fish live here. Telaga Warna Lake: This lovely lake lies in Wonosobo District, Central Java. Telaga means lake and Warna means color, this lake is named after Telaga Warna because its color can change in accordance with the lake’s mood. That is why this unique lake is a suitable place for you to refresh your mind. Danau Diatas: This lake is located side by side with Danau dibawah. Theoretically diatas means up meanwhile dibawah is the opposite which is down and both of them is considered as twins lake. You can enjoy the view of the lake from above. Danau Dibawah: Both of Danau Diatas and Danau Dibawah are located in Solok, West Java. Before going up to see the view from above you will getting spoiled by the natural view around this lake. A reminder to bring your jacket if you wanted to visit this lake because the weather is quite cold since it is located on the top of the hill. Aneuk Laot Lake :The northern part of Indonesia also have a natural wonder named Aneuk Laot Lake. Talang Lake : this is one of the beautiful lakes in Talang Mountain area. Situ Patenggang : located in Bandung this lake is well-known for its green scenery. Situ Gunung : a lake which has painting-look-alike scenery. Kawah Ijen : one of the biggest acid lake in the world which has beautiful scenery. Habema Lake : also called as Yuginopa in Jayawijaya and considered as the highest lake in Indonesia. Kaco Lake : the water’s color in this lake is very contrast with its surroundings, the water is shining in blue color. 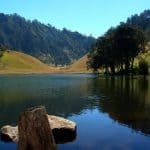 Telaga Warna Dieng : located in Dieng’s plateau, Wonosobo. This is a perfect place to be visited anytime but evening because the scenery will be covered by fog. Those are some references for those who want to do lake tours during holiday. Indonesian Lakes are beautiful and it will be awesome if you could visit those places directly.